Hollywood legend Cary Grant won audiences the world over with his charm and sophistication as an actor. Grant created a light, comic style that many have tried to imitate but none have surpassed. In seventy-two films made over four decades, Grant served as both a romantic ideal for women and a dashing role model for men. Cary Grant was born Archibald Alexander Leach on January 18, 1904, in Bristol, England. His parents, Elias and Elsie Leach, were poor, and they quarreled often as they struggled to raise their only child. Grant found escape from the family tension in the newly emerging "picture palaces." He recalled in a Ladies Home Journal (1963) interview that "those Saturday matinees free from parental supervision were the high point of my week." At the age of ten Grant was told that his mother had left for a seaside resort. In reality she had been sent to a nearby mental institution for a nervous breakdown. She remained there for twenty years. Grant was an adult before he learned of his mother's true whereabouts. "There was a void in my life," Grant said of the lost time with mother, "a sadness of spirit that affected each daily activity with which I occupied myself in order to overcome it." in Somerset, England. While at the school he became interested in the theater and in theatrical lighting. It was at the Bristol (England) Hippodrome vaudeville (traveling variety entertainment) theater that Grant realized just how he would escape his worry-filled working-class environment. After being allowed backstage during a Saturday matinee, Grant decided to become an actor. "I suddenly found my inarticulate self in a land of smiling, jostling people wearing all sorts of costumes and doing all sorts of clever things," Grant remembered. "And that's when I knew! What other life could there be but that of an actor?" Grant ran away from home and joined the Bob Pender Troupe of comedians and acrobats. He was soon forced to return home, when it was discovered that he had lied about his age and about having his father's permission to work. At thirteen Grant was a year too young to obtain a work permit to work legally. Undeterred, he waited until he turned fourteen and then got expelled from school so that his father might let him rejoin the group. Grant learned comedy, gymnastics, and pantomime from Pender's group. His later skill at physical comedy and timing owed much to this early training. His travels with the troupe led him to New York, where he decided to stay and seek success. Using his vaudeville skills he worked Coney Island as a stilt-walker and eventually won roles in light musicals and plays. In 1932 Grant took the advice of a friend and went to Hollywood for a screen test. Paramount offered him a contract but insisted he change his name from Archie Leach. So the more glamorous Cary Grant was chosen—and a great film career began. Even in his earliest film roles, Grant demonstrated the elegant sophistication that is the very opposite of his working-class background. His credentials as a traditional leading man were established with his appearance opposite Marlene Dietrich in Blond Venus. The perfect format for displaying Grant's verbal and physical agility was in the screwball comedies of the 1930s. In The Awful Truth, His Girl Friday, Holiday and Bringing Up Baby, Grant's deft comic touch is prevalent. His Oscar-nominated performances in Penny Serenade and None But the Lonely Heart show that Grant was a capable dramatic actor as well. Throughout his career Grant continued to successfully play the charming leading man, even as late as 1964, with the film Charade. Although Grant's comedies represent the majority of his best-remembered roles, his work with the director Alfred Hitchcock in several classic films offers a departure from his usual image. Hitchcock deliberately played against Grant's familiar persona by introducing psychological twists that are in startling contrast to the actor's smooth surface elegance. Although Grant achieved tremendous success as an actor, his first four marriages ended in divorce. Grant speculated that this poor record was tied to the disappearance of his mother. His fifth wife, Barbara Harris, was at his side when he died of a massive stroke in 1986. Today Grant's name remains a symbol of the stylish sophistication that was his trademark, and repeated viewings of his films reveal an actor whose ability to delight an audience is timeless. 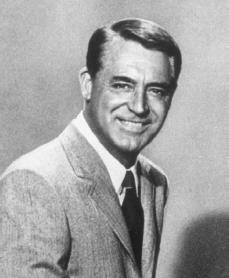 Harris, Warren G. Cary Grant: A Touch of Elegance. Garden City, NY: Doubleday, 1987. McCann, Graham. Cary Grant: A Class Apart. New York: Columbia University Press, 1996. Nelson, Nancy. Evenings with Cary Grant: Recollections in His Own Words and by Those Who Knew Him Best. New York, NY: W. Morrow, 1991. Wansell, Geoffrey. Cary Grant: Dark Angel. New York: Arcade Pub., 1996.